I often travel solo from United States to Europe with my three kids. Anyone who travels with children knows it’s not easy, and when jetlag is added to the mix, it can be downright torturous. Each child gets on his own jetlag- induced sleep schedule, which is different from mine, and the result is total exhaustion. When I started using Uplift a couple of years ago, things have improved dramatically. Our travels have become much easier and we have been able to make the best of our time overseas without losing days to catch up on sleep and energy. Simply, I have been having much more fun traveling with my kids. When we land, I try to use the taxiing time to set up the Uplift and watch the videos. I also try to get my own points done right on the plane. You have to be planful about footwear because sometimes you need access to the ankles and shins. Usually, I will do Uplift for my kids once we receive luggage and pass passport control, but there have been occasions when I didn’t get to it until after we’ve arrived at our hotel. Most often, the kids just crash once they see a bed, and I’ve even used Uplift on sleeping children. It’s actually easier that way. Because I have three kids and they are fairly young, I first use a pen to mark dots on all points on each side, on each child. Then, as I am holding their points, if they squirm or pull away, I don’t have to find the points again. If it’s morning time, we will often crash for a few hours, and will head out to explore in late afternoon. If it’s an evening and the kids stayed awake through Uplift, we will often just eat and go to bed. I put my kids to bed at as normal time as possible that first day and wake them up at as normal time as possible the next morning. Sometimes they sleep from midnight to 10 or 11 am. I consider that normal. The second day, again, I try to move even closer to the normal bedtime. Usually, by the second morning we are all right on the schedule. The best part is, we all sleep through the night. Many times I’ve returned to the States with my kids late on Sunday evening after school vacation week spent in Europe, and after using Uplift, they went to school on Monday with no difficulty, and I went to work. With Uplift, when I make travel plans, I do not have to take jet lag into account. The kids sleep through the night immediately and usually wake up at a normal time. Sometimes I might be a little more tired than usual, but my sleep is not disrupted. And, as every mom knows, it makes all the difference. 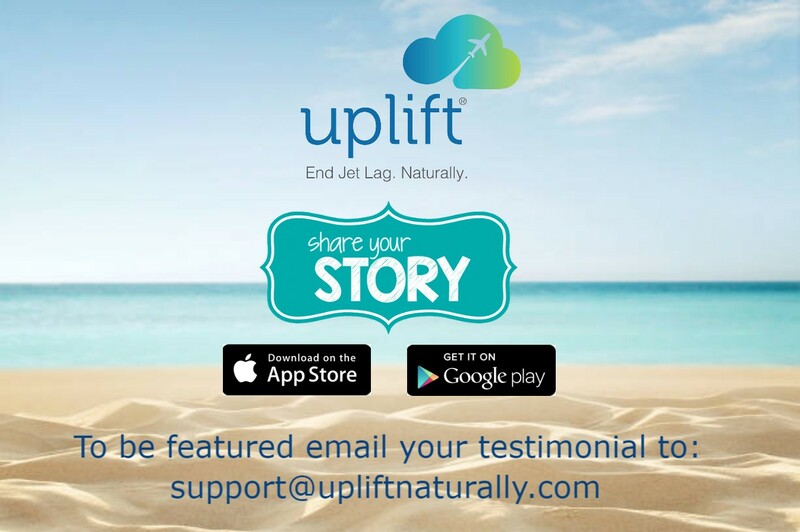 Uplift has become a seamless part of our travel routine. With Uplift, there is much more energy and more time to enjoy a trip. I am so happy I found it.